Just when you thought that Mexico had revealed herself to you along comes Alec Dempster with an extraordinary revelation: Loteria Huasteca. This book features a mesmerising set of 54 woodblock prints and is a follow-up to the extraordinary first book, Loteria Jarocha. The two books form part of a remarkable series on ‘loteria’, the age-old Mexican game of chance similar to bingo. Dempster informs us in his introduction to the book that the concept of the game has its origins in Italy and Spain and was brought to Mexico in the 17th Century. In fact the word ‘loteria’ is the Spanish word for lottery. It is believed that it came presumably via Christian missionaries to what was then called New Spain – today’s Mexico – in 1769. The Mexican game is played with 54 cards on a board with a randomly created 4 x 4 grid of pictures with their corresponding name and number. Alec Dempster uses ‘loteria’ as a metaphor in which the region of Northern Veracruz – La Huasteca – in particular unfolds before your eyes. To begin at the beginning, Alec Dempster is a remarkable musician, writer and painter, woodblock artist silkscreen-printer and painter, and probably one of the most generously endowed artistic polymath in the Americas. What he does in both his art books is bring La Huasteca alive for us. Dempster was on his way to that part of Northern Veracruz to attend a folk music festival in Citla, a small town in the hills of La Huasteca. A folk musician with a glorious grasp for Mexican culture Dempster was well known for his folk music in Mexico and had been invited to attend this music festival in the remote region of Veracruz. And that is how the story begins. 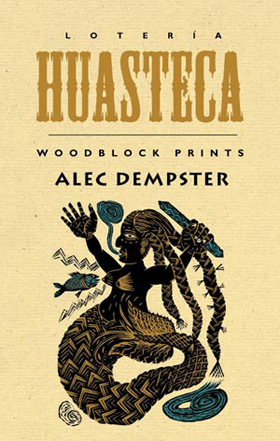 In this book Dempster tells the story of his journey to La Huasteca in the form of a ‘loteria’ board – with 54 prints hauntingly cut out of wood and printed for the first time in this superb book. 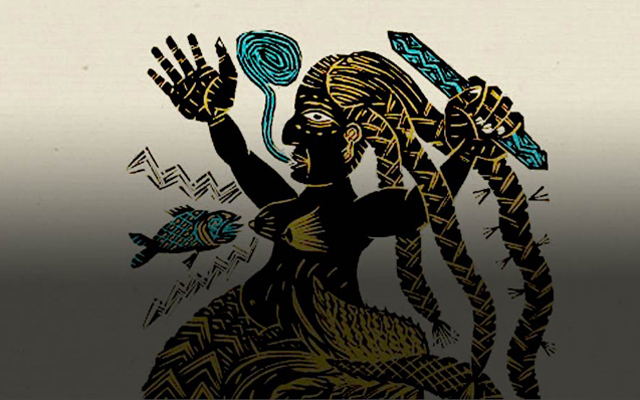 Salamanders and crocodiles vie for attention with gods and goddesses’ folk tales and musical forms. Each is an image frozen in a one-of-a-kind woodblock print with an accompanying text that explains the origins of a tale native to the region and the oral history of the region is revealed before our eyes. The images are primordial made in strokes of the knife that move with visceral energy across the geometrically-shaped woodblock. Accents are added to make the woodblock print come to life. And because Dempster has a curious eye, his attention to detail both in image and in word is remarkably succinct. The prints are never crowded and yet every important detail is there, be it the scaly skin of a fish or the décor of traditional pottery, worry-lines on a gnarled face or the singular movement of a musical note. Alec Dempster is also a lyrical story teller. He has a knack for idiom and metaphor and is also a fine narrator. I am tempted to suggest that he might be the first Canadian-Mexican griot. All this of course stems from his wonderful sense of adventure and the detail of a Boswellian diarist. Add to that the depth of his research and you have a formidable authority on the Veracruz region of Mexico, at any rate. I would never be able to think of La Huasteca in Northern Veracruz in the same way as I do after reading this exquisite little book. It fills you with desire – the desire to pack a bag and head for La Huasteca but first it makes you delightfully mad with the beauty of the culture of the place. The comprehensive glossary at the end of the book is a fine idea and enables a greater understanding of some of the more obscure terms. One always wishes for a phonetic guide especially if you are not a native Mexican speaker. But that might be thought for a future volume should one be forthcoming. This is a superbly designed book, published by one of the finest print houses in Canada. It has been extremely inexpensively produced and yet feels great to touch and feel. Paper stock and printing is important in art books and this has been well-chosen by the publishers, The Porcupine’s Quill, to suit the fact that these are woodblock prints. It is a remarkable book by a remarkable artist and is more than being a coffee table book it is essential to any library that is a serious archive of art books. Published By: The Porcupine’s Quill, Erin Ontario, Canada. Alec Dempster was born in Mexico City in 1971 but grew up in Toronto where he eventually studied printmaking at York University. He returned to Mexico on two occasions while at university, which motivated him to live in Xalapa, Veracruz from 1995 to 2009. He now lives in Toronto. The imagery in his artwork is a complex mix of surrealistic associations and memories that crosses cultural boundaries. In addition to prints, he has worked on a number of illustrated books and portfolios of prints. The prints shown on this page are from one of these book projects.